Muvi’s multi store cloning feature allows you to clone all your data from parent store to different child stores. For example, if you have created multiple stores and want to copy the data from the parent store to all your child stores, you can do it simply with a click. You can also switch from one store to another without the hassle of logging in and logging out repeatedly. If you want to create multiple stores, then you need to buy subscription for each individual store. After creating the stores, you need to add a support ticket. We will merge all your child stores with the parent store. 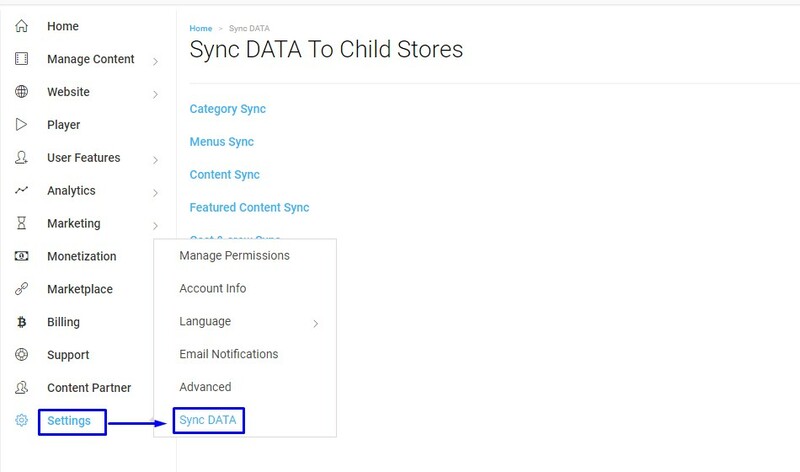 After your child stores are merged with the parent store, you need to sync data from the parent store to all your child stores. Note: After syncing the data from parent store to child store, you will only be able to view the data in child store. You cannot edit any data in any child store. Even though videos and content will be same for all the child stores, you can have different templates, monetization plans, users and analytics for each different store. You can switch between the stores easily, without the hassle of logging out and logging in repeatedly. You will see the list of stores. Click on the store that you want to switch to.